The Fort Meade Alliance is proud of all that it has accomplished with the help and support of the dedicated Fort Meade community. Created Tech Mania that has connected more than 1,500 students and teachers in the region with hands-on demonstrations of cutting edge technology from the business community. Established the Kenneth O. McCreedy Scholarship for Meade High School Students that successfully complete the Meade High Homeland Security Certificate Program. Awarded third scholarship in June 2014. Led the development and distribution of the Destination Fort Meade Guide, currently on its 7th edition. The Fort Meade Alliance was awarded a grant from the Anne Arundel Workforce Development Corp. to provide business engagement to employers looking to hire veterans in Maryland through the Military Corp Connect (MC3) program. The Fort Meade Alliance was awarded a grant from Anne Arundel County Public Schools to assist in the development of the Tapestry Program. This program is a DODEA funded initiative to provide professional development for teachers to better help them understand the needs of military children in their classrooms. The Fort Meade Alliance won an Award of Excellence for its 2014 Annual Report from the annual Apex Awards for Publication Excellence, an annual competition for corporate and nonprofit publishers, editors and designers. The Fort Meade Alliance was recognized by the U.S. Department of Defense for its efforts in supporting the successful Healthy Base Initiative pilot program at Fort George G. Meade. 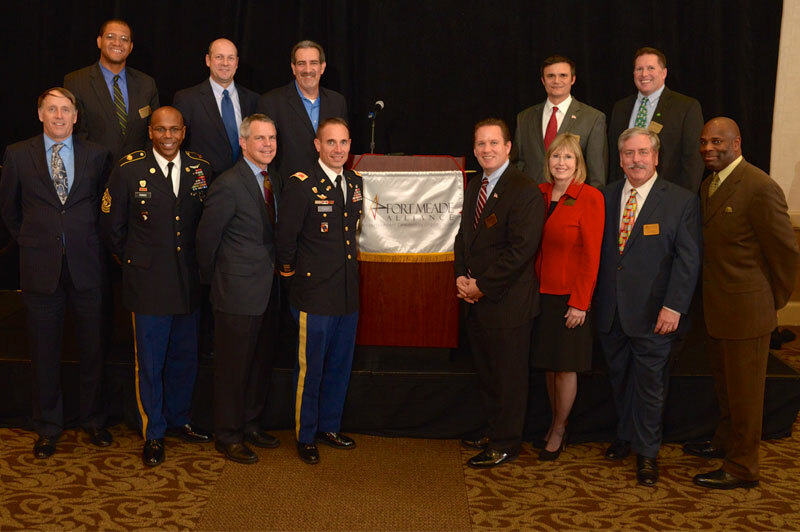 The Fort Meade Alliance was recognized by the U.S. Army as a model community organization. U.S. Army officials interviewed the FMA to determine best practices for other groups to emulate. The Fort Meade Alliance celebrated its 10-year anniversary. The Fort Meade Alliance was awarded a Certificate of Achievement by the U.S. Army in recognition for its generous contributions to the Fort Meade Spouse Appreciation Day event. The Fort Meade Alliance Education and Workforce Development Committee received a Certificate of Appreciation for its valuable STEM mentoring contributions to Anne Arundel County Public Schools. The Fort Meade Alliance was awarded a Certificate of Appreciation for its outstanding support of the 28th Annual National Night Out, presented by the Fort Meade Directorate of Emergency Services and Picerne Military Housing. The Fort Meade Alliance and the U.S. Army Garrison at Fort George G. Meade earned the 2010 Secretary of Army Quality of Life Partnership Award presented to new or exciting partnerships that have improved soldier or family quality of life programs for partnering with local businesses and organizations including USO of Metropolitan Washington to entirely furnish and outfit a new Soldier and Family Assistance Center. The Fort Meade Alliance received the Commander’s Certificate of Excellence for its donation to the Soldier and Family Assistance Center at Fort Meade. The Fort Meade Alliance was honored with a citation from Gov. Martin O’Malley on behalf of the Governor’s Office of Minority Affairs (GOMA) for its partnership with GOMA on the Fort Meade Regional Small and Minority Business Government Contracting IT Forum held in May 2010. Governor Martin O’Malley declared June 16, 2010 Fort Meade Alliance Day. Fort George G. Meade Installation Commander Col. Daniel Thomas presented the Fort Meade Alliance with the Commander’s Outstanding Citizenship Award honoring the organization’s exceptional support to the Soldier and Family Assistance Center and the Wounded Warriors on Fort Meade. The Fort Meade Alliance was recognized as the Annapolis and Anne Arundel County Chamber of Commerce’s Non-Profit of the Year. The Fort Meade Alliance received a certificate of appreciation from Anne Arundel Public Schools for its partnership with and contributions to the Homeland Security Signature Program Integrated Community Stakeholders Team at Meade High School.